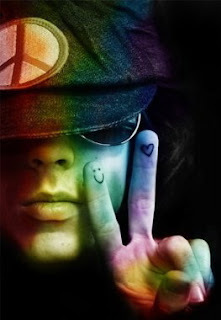 *Hippie*: originally a youth movement that began in the United States during the early 1960s and spread around the world. Hippies sought to free themselves from societal restrictions, choose their own way, and find new meaning in life. One expression of hippie independence from societal norms was found in their standard of dress and grooming, which made hippies instantly recognizable to one another, and served as a visual symbol of their respect for individual rights (wikipedia). I found myself reflecting today on how traditions and cultures have slowly changed as the 21st century has continued to move along. A lot of traditions have been modernized, still keeping their ancient secrets and laws, but yet flowing with the times and seasons. A lot of traditions have kept their stringent laws, not willing to let go. They have discarded the livid younger generation, their children who are not willing to bow down to strange gods. Those ones haven't changed. Today, we can still find hippies, wearing the very same clothes that their ancestors wore in the 70s, and I adore them for their strong sense of connection. They are still the same. Others have changed a little, allowing new fashions and trends into their societies. I see my thoughts as an opportunity to reveal to you the One who created the times and the seasons, the Almighty God. The Master of traditions, both old and new. The Maker of heaven and earth...Who was, is, and still is to come. He created them all. So what about Him? The dilemma here is that the younger generation does not know that He has a fashion sense also for the 21st century. They see Him as the God of Moses and Elijah, but not as the God of this generation. But I tell you, until you begin to see Him as the God of our generation, He will not make an impact in your life. Oh, He is so modern. He designed the human brain to evolve with the times. He gave architects the wisdom to design the sky-scrapers and the modern day state-of-the-art residences. He gave us the intelligence to build new bridges and underground tunnels. He even gave the unction for people to create modern musical instruments to glorify His Name. He is as modern as it gets. God is truly awesome, it takes deep thinking to really appreciate the length and breadth of this Great God,and i love Him dearly. I was listening to a message preached many years ago. How true and applicable the words are for today. True, traditions and customs have slowly evolved, but our fast paced generation has left most of it behind, God never changes, but is the author of change (amazing shey) He is very much the God of our generation. Well said. U do have a nice blog here! Sewa...yayyy...missed ur presence. I'm good...we've been thinking of "our" template...lol. (I think u know what I mean). Muhaha! Rita...but isn't it amazing how many young people relegate Him to being a God of ancient times, and not of the present? Even though they may not say it, they act as though that is the case...it's pretty interesting. John...I like how you coined it, "God never changes, but He is the author of change." Thanks...*smiles*. You have great a arrow in piercing sentiments.... your wrinting... your pen... expresssion of great faith....very inspiring. You know I found myself coming to your blog for inspiration. That's what you do to me. God bless you for blessing me. It is sad to think the God of ages can be considered out of fashion! It is particularly sad to see people who don’t think there is a need for him in their lives…how can he that is omnipotent, omnipresent and omnibenevolent be irrelevant? To me he is the alpha and the omega…he is so VERY relevant at all times. Sisterly, u know i'll be very excited to help.Search ankara boutique on facebook, she has a wide range of designs and they start at 20/25. You're not going home(as in Naija)?? If you mean where to get nice stuff in Naija,i'll have to get back to you on that. what more can i say..He is the beginning and the end ... that means He remains relevant from the beginning to the end..
remains me of the phrase "unchangeable changer". He is, he was and he is to come. We just have to move with him as he is moving.. Yes, and the best thing about God is His ever forgiving nature…even when the words have to be yelled before we hear…yelled again before we understand…and yet yelled again before we do His will…. Chukbyke...that's what the word is supposed to do, pierce our hearts...thanks. Parakeet...you inspire me to write more...thank God. Aloted...I giggled a little when I saw "unchangeable changer" because I haven't called Him that in a while. When I call Him that phrase it excites me, for some weird reason. It sounds...so...powerful! I actually say it as "UNCHANGING Changer!!!" Haleluyah! Yeah, we def have to move along as He's moving. Thanks Sewwie...(he he, I think I have many nick-names for u). i always learn a new thing when i come here..
just stopping by to say heya! Newlife...it's so touching when I think of how many prayers pass through the clouds through people like you...(it isn't unheard I tell you, and I say Amen...) Thanks. Rayo...Ooooooooh, guess what? There's a scripture that says what you're saying in a very beautiful way...Ecclesiastes 1:9-10"That which has been is what will be, that which is done is what will be done, and there is nothing new under the sun. Is there anything of which it may be said, “ See, this is new”? It has already been in ancient times before us." Also, my boo just added his own scripture as I was typing, Hebrews 12:1a..."Therefore we also, since we are surrounded by so great a cloud of witnesses, let us lay aside every weight..."
Unwritten...what shall we say to these things than to say 'thank God.' He's connecting mundane things to the things of His kingdom...I thank Him for real! How bodi? Have u updated? Beautiful, you have a way of putting things so simply. Yes he is the God of yesterday, today and forever, although he never changes, he changes man and is relevant for all time and ages. I wish everyone will see the importance of God in their lives and embrace him. To anyone reading...May God reveal Himself to someone this week. If you're like me, I know you hunger for MORE of God's presence every time you think about Him. Today, He reminded me that He is my VERY PRESENT help in time of need. That means that He's always present, you may not see Him sometimes...but He's always right next to you, with an ALL-KNOWING smile...because He knows what you're going through and where you are going to. I need Him to speak to me. I need Him to say something to me now, more than ever before cos I'm in at a cross road. Amen! God's word is ever true! Ps: you just won an award on my blog! Go and see it! he is as constant as the northern star. It also saddens me when i see the world appropriating laws and principles clearly put in place by God, but without acknowledging them as such e.g. the secret, the so-called laws of abudance, law of attraction etc etc.